Marina del Rey has been a long time in the making. Construction of the jetties for the present entrance channel began in December 1957, but efforts toward a harbor at this location actually began some seventy years earlier, sponsored, ironically, by a railroad.In 1887, a far-sighted man, named M.C. Wicks, organized the Port Ballona Development Company under the auspices of the Santa Fe Railroad. Wicks dreamed of developing the Playa del Rey estuary and inlet into a major commercial harbor to serve the Los Angeles area. He managed to raise $300,000, all of which went for construction work over a three-year period. However, Wicks went bankrupt and the area was eventually taken over by duck hunters. Another quarter of a century passed without action, but the dream kept recurring. In 1916, the U.S. Army Corps of Engineers reported to Congress that a new proposal to develop the Playa del Rey Inlet and basin as a major harbor was impractical. Twenty years later, in 1936, Congress authorized reconsideration of the negative 1916 report and the County Board of Supervisors ordered another study in 1937. This time there was competition, and the decision went to San Pedro, where major expansion had been approved to form the present Los Angeles Harbor. From this point on, the dream focused with increasing clarity on a harbor for small craft. World War II caused a temporary halt to planning, but on September 7, 1949, the U.S. Army Corps of Engineers submitted a report indicating the feasibility of construction of a pleasure craft harbor for 8,000 boats at a total estimated cost of $23,603,000. In 1953, the County Board of Supervisors sponsored State legislation which eventually granted the County a $2 million loan from State tidelands oil revenues to assist in purchase of the new harbor site. In 1954, President Eisenhower signed Public Law 780, making the Marina del Rey harbor an authorized federal project and planning moved into high gear. The federal commitment, however, was limited to the "main navigational features" and involved a 50-50 sharing of these costs by the local sponsor; in this case, the County of Los Angeles. On November 6, 1956, a general election resulted in County voters approving the revenue bond method of financing the remainder of the project, and in December 1959, a $13 million revenue bond issue was sold to provide funds for much of the actual construction. Meanwhile, in December 1957, construction of the "main navigational features" began as a joint Federal-County project; by November 1958, the entrance channel jetties were completed and the first tangible facilities had emerged from the long-standing dream. Big projects have big problems, and Marina del Rey had its share; construction delays plagued the early development. Shortly after the harbor finally opened for operation, it suffered storm damage so severe in the winter of 1962-63 that an emergency program was initiated to provide protection from wave action. 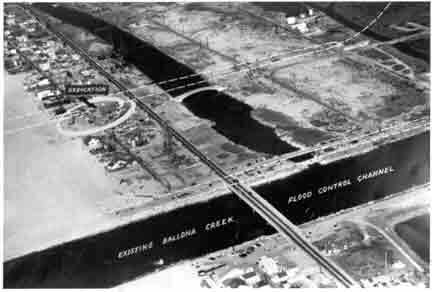 Fortunately, based on early indications of excessive vulnerability of the harbor to wave action, a model study was already well under way at the U.S. Army Corps of Engineers Waterways Experiment Station at Vicksburg, MS.
With the cooperation of the Federal Government, this study program was expedited on a "crash" basis; the model was used to arrive at a feasible interim solution, and the County proceeded to immediately construct temporary protective sheet-pile baffles in the entrance to the channel to give vital protection pending the completion of permanent protective works by the U.S. Corps of Engineers. Meanwhile, the results of the model study indicated a requirement for a permanent off-shore breakwater. The County Board of Supervisors promptly appropriated $2.1 million of the estimated cost of $4.2 million for this project as the sponsoring agency's share, and a concerted effort by the County's legislators in Congress was successful in securing the matching Federal appropriation in the 1963-64 budget. Construction of the breakwater began on October 15, 1963, and was completed in January 1965. The dispatch with which this major point project was planned, funded and constructed reflected a healthy working relationship between County and Federal governments and particularly indicated the effective representation enjoyed by the County in Congress. Marina del Rey successfully surmounted its major development problems and was progressing steadily toward complete fulfillment of its destiny. Formal dedication of the Marina del Rey Harbor was held on April 10, 1965. Federal Government: $4.6 million for 50% of cost of navigation features (jetties, breakwater, dredging main channel); State Government: $2 million, which consisted of a loan from tideland oil revenues toward acquisition of site (now repaid out of project revenues); County Government: $15.89 million for land acquisition, 50% of cost of main navigation features, more roads, administrative facilities and Coast Guard Base; Motor Vehicle Fund: $775,000 for perimeter roads. In addition, proceeds from the public sale of revenue bonds totaled $13 million, for bulkheads, sewers and underground utilities, dredging side basins, landscaping, initial costs of operations and bond service. TOTAL COST: $36.25 million for land, construction, initial operation and bond service. Today, Marina del Rey is an indispensable social, environmental and economic success, and has become a role model for other urban marinas throughout the world. As the Marina heads into the next century, considerations for future planning and design are underway. Marina del Rey will never be thought of as a finished product, but instead as a constantly evolving Marina "new town" with an inherent capacity to accept change. Currently, the County continues to strive for an optimum balance between public and private interests, as economic and recreational needs reinforce the Marina's role as a multifunctional activity center for the Los Angeles metropolitan area. (Reprinted by the Marina del Rey Convention & Visitors Bureau, from Los Angeles County's "The History of Marina del Rey").